QUẢNG NAM — An illegal logging site has been found in part of the Kôn River protected forest – the fourth recorded case of logging violations in the central province since January. Hồ Văn Minh, director of the Kôn River protected forest management board, said that the case occurred in early May. An investigation team found that illegal loggers cut trees in sub-zone 74 near the Ba commune in Đông Giang district and left 25 cubic metres of sawn log at the site. Minh said the case has been under investigation. 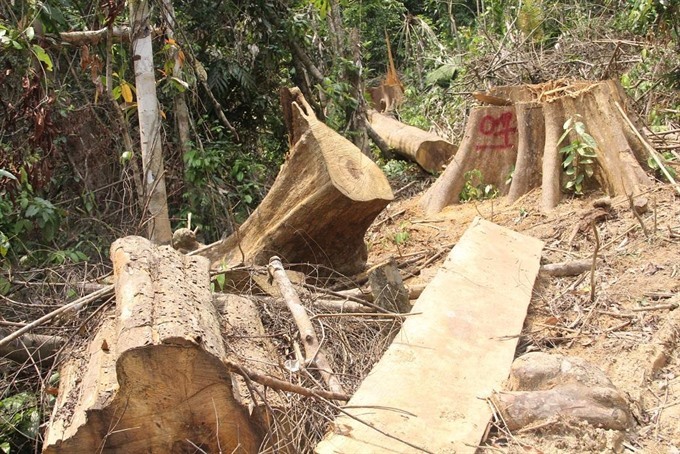 Three illegal logging cases were discovered in the Sông Thanh Nature Reserve in the mountainous districts of Nam Giang and Đông Giang in March and April. A total of 300 cubic metres of log were sawn to be taken from the forest. According to the latest report from the province, 42 violations and logging cases had been found in the area between January and April, and a total 20 cubic metres of logs and more than 400kg of forest products, such as wild animal meat and endangered herbs, had been seized. The investigation agency had been tracking a hunter that reportedly killed a gray-shanked douc langur (pygathrix cinerea) – a species of monkey that is currently listed as critically endangered, with unlimited protected status in the world by the International Union for Conservation of Nature (IUCN).